An unforgettable tour of the Wuyi Mountain, birthplace of oolong tea. All seven teas have been carefully selected to provide rich taste, floral aroma, and refreshing after-feeling. As a tea lover, I want the best tea. There are many tea shops out there. Do you know which tea shop give you the best experience and a run for your money? The problem is especially acute for Wuyi tea. 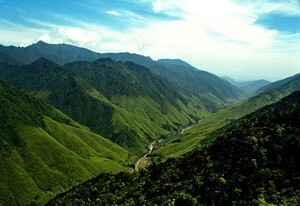 The Wuyi Mountain contains - literally - thousands of tea species. Which of the Wuyi tea should you buy? This is where this 7-in-1 Sampler comes in. Each has been selected from the Authentic Source from the Wuyi Mountain, giving you the best possible experience! More than any tea grown elsewhere, Wuyi tea is associated with natural healing. Depending on the grade, the tea leaves can be infused 3 to 9 times with each cup containing high levels of antioxidants and theanine. 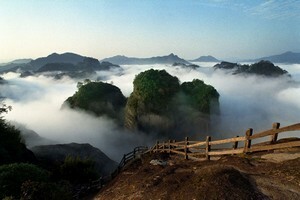 Wuyi Mountain is not just a mountain with tea growing on it. It is a gigantic volcanic fault structure with meandering rivers, vertical cliffs, deep gorges, cave systems and flat plain. The highest quality tea grows on the volcanic ashes of high mineral content, which explains the unique yanyun, or rock-like flavors. It has been found to be rich in potassium, manganese and other trace minerals. Broadly speaking, there are two kinds of tea. Lightly oxidized teas such as the white tea and green tea are raw and uncooked. They are cooling and good for cleaning the system. I drink more of them during the spring and winter. Heavily oxidized teas such as the Wuyi oolongs are roasted and cooked. They are warming and restorative. I drink more of them during the autumn and winter. In everyday life, I use tea very much like a energy balancer. For example, we have the tendency to consume too much cooling food in summer. My two girls can't seem to get enough of their iced beverage and iced cream! This can leave your body unprepared for the coldness and dryness of the winter, leading to us getting sick in the winter. There is no better way to restore some "fire" to your body by drinking a delicious cup of high quality Wuyi tea! Like climbing a mountain, I like to work my way up the grades. That way I train my palate using the lower grades, and gradually increase my capacity to enjoy the more complex flavors later on. Our all teas are Zhengyan, grown in the Middle of the Rock from the volcanic ash in the middle of the Wuyi Mountain. The teas below are sourced from one of the Big Rock of Wuyi Mountain - Tianxinyan (天心岩) - which is renown for the mother bush of Dahongpao. 4.5 out of 5 for overall quality to value ratio. I have tried almost all of them except the Lapsang Souchong at this point. My favorite was the Shuixian (I like the heavy roast), with the Tieluohan and the the Shuijingui right behind. the Dahongpao was ok. I was a bit disappointed in the depth and longevity of it with it being the "higher" class version. The Huang Guanyin I tried last night and it was interesting. Not sure its my style. I dont care for the the honeysuckle flavor profile in the background that comes from the Tieguanyin I suppose. I would definitely order any of the first three I mentioned again though. Very Nice Shuixian, Tieluohan and Shuijingui. Dahongpao AAA Grade: 3.5 out of 5. Good taste but didn't last last over multiple steeps. I definitely give the Wuyi 7-in-1 a 5+ out of 5 rating. I started "up the ladder" as you suggested going in order of quality and noticed right away with the first sample that I had ordered some exceptional tea. Of course, the aroma of the brew hit me first. I wasn't convinced yet though, for I have had tea with a delicious aroma but a disappointing flavor. But, as soon as I sipped yours, I was amazed at how it tasted and how it lingered in my mouth after I swallowed. I was even more amazed that even at the fifth steeping, I was still having an outstanding cup of tea. Normally I'm happy if I can squeeze out three. I couldn't believe I was even getting up to six and seven cups with about 3 grams! Never had done that before. Best of all, it made me feel so good as I sipped each cup. I am experimenting with multiple on-line resources but, so far, have gotten the best quality with yours. I will soon be ordering more...of everything! Wow! I thought the only tea I could drink was Jasmine green tea. And the Jasmine tea you sell is fantastic! However, now that I've been introduced to the Wuyi sampler, I have finally found a way out of just drinking the Jasmine tea. I love the roasted oolong teas! Believe it or not, my favorites were the Tieluohan and the Dahongpao teas. I've already purchased more of the Tieluohan. I liked the fire, the after taste, and the sense of well-being after drinking this tea. I would describe the Dahongpao as 'very smooth'. The only oolongs I have had were in the Chinese restaurants. The Wuyi oolongs taste nothing like the restaurant teas. They are wonderful! And your suggestion to drink these teas in the colder months was sound advice. It's nice to have this opportunity to try all oolongs Julian has to offer. Still didn't have time to try them all, but quality is just fine (I already had ordered from different sites in Europe and local shops) and most often better I get in Europe. One of the biggest surprises for me - was Huang Guanyin Tea (Yellow Goddess). I'm huge fan of taste of Tieguanyin (Iron Goddess), but it's aroma is nice. So this oolong, with complemented and deeper palate is just right. Anxi or Da Hong Pao are my long time favorites and they deliver well. The Wuyi oolongs are a revelation! - pungent and rewarding, deep and sweet. Also I have ordered, and received, a new round of the Wuyi Oolong samples as well as an extra Dahongpao â€“ these fullbodied teas with their exquisite apricot/peach-like aromas have quickly become favourites of mine! â€“ almost on a par with the Tieguanyin Wang. I wonder if there are more gentle surprises out there in the Chinese tea gardens? All Wuyi teas have been packed into 7-gram bags that will keep fresh up to 2 years. They are convenient to store and brew. You only open the bags when you are brewing the tea. You can also take them with you when you go traveling. The idea time to drink Wuyi Rock tea is after it has been aged for 2-3 years. This is not a ploy to sell you stale tea. It is true. In China, customers prefer teas that have aged for 2-3 years. This is especially true if the tea has been roasted heavily, which tends to be the norm these days. I have a long time customer who will never drink anything less than 6 months ago. Why? Because a fresh tea is too fiery and can hurt the stomach. It is a good practice for mellow the tea. So if you see an aged tea here, grab it. Because once it goes out of stock (and we don't hold much inventory), it will be replaced by a new tea. The Huang Guanyin tea, being more lightly roasted and aromatic, should be brewed like a jade oolong. What gets me excited about Wuyi Mountain and its tea. How to buy the highest grade?